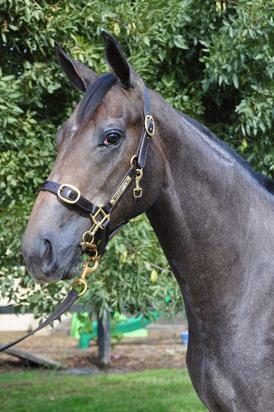 A beautiful grey filly sired by the impressive BRAZEN BEAU, out of mare ICY MIST. Roughead (g. by Sebring). Placed to 2019, 2d Singapore TC Class 5 H.
COURVOISIER (Hennessy). 2 wins at 1200m, 1750m, A$175,960, STC Gloaming S., Gr.2, Aristocrat H., 2d AJC Canonbury S., L, Tamarama 2YO H., 3d AJC George Main S., Gr.1, STC Peter Pan S., Gr.2, AJC Bankstown Club 2YO H., City Tatt's RC Chairman's 2YO P., STC Lewisham Saw Works 2YO H. Sire. Snow Beauty (Danehill). 3 wins to 1350m, A$100,478, VRC Ansett Cup H., STC Rockdale H., JS McMillan Printing H., 2d BTC Moet & Chandon H., STC Riverina Charm H., 3d STC Tea Rose S., Gr.2, 4th VATC Angus Armanasco S., Gr.3. Ice King (Snaadee). 9 wins to 1500m in Aust. and China, QTC Regal Advice H., BTC Unequalled H., 2d AJC Blacktown Workers Club H., STC Yuletide 2YO H., 3d Tamworth JC Prime Television H., L, 4th AJC Stan Fox S., Gr.2, STC Heritage S., L.
CENT PER CENT (Secret Savings). 8 wins-2 at 2-from 1150m to 1600m, NZ$71,200, A$390,950, Gosford Guineas, L, Wyong RC Magic Millions S., AJC Gillette Fusion 2YO H., STC Theraces.com.au H., Crowne Plaza Terrigal 2YO H., Waikato RC United Cleaning Services H., Waipa RC Te Awamutu Cup, 2d Waikato RC Legacy Lodge H., Pencarrowstud.co.nz H., Hamilton Building Supplies H., BOP RC Gartshore Shopfitting H., 3d ARC Chairman's Trophy, JRA Trophy, Crombie Lockwood Insurance Brokers H., Waikato RC Seafood Bazaar H., 4th QTC TJ Smith Classic, Gr.1, GCTC Magic Millions 3YO Trophy, RL. Minnie Mah (Al Maher). 2 wins at 1000m, 1200m, A$96,194, MRC Patinack Farm H., 2d MRC Michael Andrew Farewell H., MVRC Webb Australia H., Styletread.com.au H., 3d MVRC Typhoon Tracy S., L, MRC Australian Defence Force H., Geelong RC Black Pearl H., MVRC CFMEU Eight Hour Labour Day H., MRC Schweppes H.
Icy Mist. 3 wins. See above. Nesnas. Winner at 2, AJC Darling Harbour 2YO P., 2d AJC Petersham 2YO H. Producer. Hotel Casino (Magic Albert). 6 wins to 1300m, A$262,525, STC Summer Racing Welter H., AJC Filante H., Thrifty H., Double Bay H., STC Nivea Visage H., Erskineville Hotel H., 2d AJC Exceed & Excel Welter H., 3d AJC Hall Mark S., L, Hawkesbury RC Yalumba Cup, L, STC Fenech Boxing H., Premium Beverages Welter H., AJC National Jockeys Celebration Day H., Sydney City Lexus H., Alexandria H., STC Pie Face H.
Tycoon Princess. 3 wins-1 at 2-at 1000m, A$165,730, VATC Elsternwick H., Marmont H., 2d VATC Nunkalowe 2YO H., Monash Sunway H., MVRC Night Racing Tonight H., VATC Future H., Lord Dudley H., JG Heywood H., 3d VATC Excited Angel H., Sturt H., Avon H., Limerick Arms Hotel H., 4th MVRC Silver Jubilee S., L, VATC Bounding Away H., L. Producer. Barigan Boy. 12 wins from 1200m to 1600m, A$244,708, STC Freeway Hot-Fridays H., SAJC Adelaide Casino H., Boag's Draught H., 2d SAJC Scalzi Produce H., Sportingbet H.-twice, Adelaide Galvanising H., 3d SAJC Capital Transport H., ATC Cara Brett Hall H., SAJC Irish Race Day H., Adelaide Galvanising H.
TEXAS GEM (Canonero). 9 wins, Louisiana Downs Airline S., L.
Jalaab (Green Desert). 4 wins from 1400m to 1600m in GB, U.S.A. and U.A.E, Nad al Sheba Al Sahraa H., Doncaster May Day Bank Holiday S., 2d Jebel Ali S., L, Nad al Sheba Burj Nahaar S.
PAIARDINA (Casamento). 4 wins-2 at 2-at 1500m, 2000m, €106,335, Rome Premio Archidamia, L, Milan Premio Alberto Zanoletti di Rozzano, 2d Milan Oaks d'Italia, Gr.2, Rome Premio On the House. CAT SHAKER (Catienus). 4 wins-1 at 2-from 1m to 8½f, Turfway Park Rushaway S., L, 2d Ellis Park Tri-State H., L, 3d Mountaineer Park Independence Day S., L, Turfway Park WEBN S., L.
TOCOFONDO (Engrillado). 3 wins at 1600m, 2000m in Argentina, San Isidro Clasico Botafogo, L.
APPREHENDER (Posse). 11 wins to 7f, US$730,694, to 2018, Prairie Meadows Ed Skinner S., L, 2d Oaklawn Park Count Fleet Sprint H., Gr.3, Prairie Meadows Iowa Sprint H., L-twice, 3d Oaklawn Park Count Fleet Sprint H., Gr.3. NINE ROUTE (The Factor). 3 wins-1 at 2-from 6f to 1m to 2018, Aqueduct Gander S., L.
DUBLIN (Afleet Alex). 2 wins at 2, US$438,949, Saratoga Hopeful S., Gr.1, 2d Oaklawn Park Southwest S., Gr.3, 3d Oaklawn Park Arkansas Derby, Gr.1, Rebel S., Gr.2. Sire. MANIPULER (Grand Reward). 6 wins-1 at 2-at 1200m, 1400m in Argentina, Palermo Clasico Old Man, Gr.3, San Isidro Handicap Simonside, Palermo Handicap Jorge H Iglesias, Especial Asociacion Amigos de la Av San Martin y Adyacencias, 2d San Isidro Handicap Kendal, 3d Palermo Handicap New Dandy. SONNETEER (Midnight Lute). 2 wins at 8½f, US$513,166, to 2018, Oaklawn Park Fifth Season S., L, 2d Oaklawn Park Rebel S., Gr.2, 3d Louisiana Downs Super Derby, L, 4th Oaklawn Park Arkansas Derby, Gr.1. JOEY'S FIRST JOVE (Northern Jove). 18 wins-1 at 2, US$309,072, Garden State Joyce Kilmer H., L, Equus H., L, Philadelphia Park Batty S., L, 2d Monmouth Ocean Hotel S., L, Wolf Hill S., L.
INDIAN SKIMMER (Storm Bird). Top of The 1988 European 4YO+ & 1987 French 3YO Free Hs (1900m - 2100m). Top filly on The 1989 European 4YO+ Classification. 10 wins from 1800m to 2100m, £479,407, 2,384,600fr., US$216,000, Chantilly Prix de Diane, Gr.1, Longchamp Prix Saint-Alary, Gr.1, Prix d'Ispahan, Gr.1, Newmarket Champion S., Gr.1, Phoenix Champion S., Gr.1, Newmarket Sun Chariot S., Gr.2, Sandown Gordon Richards S., Gr.3, York Musidora S., Gr.3, Newmarket Pretty Polly S., L, 2d York International S., Gr.1, 3d Breeders' Cup Turf S., Gr.1, Sandown Eclipse S., Gr.1, Brigadier Gerard S., Gr.3, 4th Sandown Eclipse S., Gr.1. Producer. Sanoosea (Storm Bird). Winner at 7f, 2d Curragh Blandford S., Gr.2, Chester Dee S., L, 4th Curragh Tattersalls Gold Cup, Gr.2, Goodwood Foundation S., L.
COME SEE YOU (Sri Pekan). 5 wins from 1650m to 2000m, £2,265, S$530,000, HK$4,952,000, Singapore Classic, Gr.3, HKJC Pacific Ocean H., January Cup, Swaine Cup, 2d HKJC Queen Mother Memorial Cup, L, Sha Tin Futurity Trophy, L.
SMILE STONE (Juniper). 13 wins at 1200m, 1400m to 2018 in India, Bangalore City Gold Cup, L, Bangalore Chief Minister's Cup, L, 2d Bangalore Sprinters' Cup, L, Sprint Championship Gold Cup, L-twice. TOUCH OF THE BLUES (Cadeaux Genereux). 8 wins-4 at 2-from 1300m to 1600m, 710,143fr., US$1,517,540, 20,000Dm., Woodbine Atto Mile S., Gr.1, Keeneland Maker's Mark Mile S., Gr.2, Criterium de Maisons-Laffitte, Gr.2, Longchamp Prix du Pin, L, Craon Criterium de l'Ouest, L, 2d Breeders' Cup Mile, Gr.1, Hollywood Park Shoemaker Mile S., Gr.1, Keeneland Turf Mile S., Gr.1, Maisons-Laffitte Prix Herod, L, 3d Keeneland Turf Mile S., Gr.1, Hollywood Park Shoemaker Mile S., Gr.1, Keeneland Maker's Mark Mile S., Gr.2, Santa Anita San Simeon H., Gr.3, Saint-Cloud Prix Eclipse, Gr.3. Sire. CRAWDADDY (Girolamo). 2 wins at 6f, 7f, Belmont New York Stallion S. (3YOc&g), L.
COUNTRY PINE (His Majesty). 7 wins-1 at 2, US$239,618, Aqueduct Withers S., Gr.2, Discovery H., Gr.3, Queens County H., Gr.3, 2d Aqueduct Wood Memorial S., Gr.1, Bowie Governor's Cup, Gr.3, 3d Gulfstream Park Hutcheson S., Gr.3. Sire. OMG (Jules). 3 wins at 1600m, 2000m in Brazil, Gavea G.P. Professor Nova Monteiro, Gr.3, 2d Gavea Prova Especial Jayme Augusto Calvet de Vasconcello, 3d Gavea Classico Primavera, L, Prova Especial Raphael de Souza Paiva. NOPEX (Jules). 3 wins from 1300m to 1800m in U.S.A. and Brazil, Gavea G.P. Nestor Jost, Gr.3, Gulfstream Park Allowance. ULTRAPASSANDO (Wild Event). 8 wins from 1600m to 2200m in U.S.A. and Brazil, Taruma G.P. Derby Paranaense, Gr.3, Cidade Jardim Classico Delegacoes Turfisticas, L, 2d Cidade Jardim G.P. Presidente Antonio Correa Barbosa, Gr.2, G.P. Piratininga, Gr.2, 4th Cidade Jardim G.P. Piratininga, Gr.2, G.P. Ricardo Lara Vidigal, Gr.3. BOREALE (Octagonal). 7 wins from 1200m to 2050m, A$597,450, AJC Villiers S., Gr.2, QTC Members H., L, VRC Dulcify H., MVRC Sky Channel H., Keith Loughnan Memorial H., AJC Love 'n' Deuce Tennis Centre H., Arncliffe H., 2d GCTC AD Hollindale S., Gr.2, 3d AJC Doncaster H., Gr.1, NSW Tatt's RC Tramway H., Gr.3. DONAR (Canny Lad). 3 wins-2 at 2-at 1200m, 2050m, A$352,680, MVRC AAMI Vase, Gr.3, 2d VRC Sires' Produce S., Gr.1, MVRC Bill Stutt S., Gr.2, 3d Victoria Derby, Gr.1, QTC Castlemaine S.H., Gr.1, Sires' Produce S., Gr.1. THE NORTH (Marauding). 5 wins-1 at 2-from 1200m to 1600m, A$209,300, AJC Carbine Club S., L, Tamworth JC Prime Television H., L, AJC Bankstown District Sports Club Welter H., Belmore 2YO H.
LOBO'S LEGEND (Trippi). 2 wins at 1150m, 1800m, R1,360,275, in 2017-18, Turffontein South African Classic, Gr.1, 2d Turffontein Betting World P.
SCHISM (Count Dubois). 3 wins from 1400m to 2200m, R204,700, Kenilworth Winter Oaks, L, Winter Series Racedays H., 2d Kenilworth Soccer 13 H., 4th Kenilworth Final Fling S., Gr.3. Producer. PINE PRINCESS (Captain Al). 5 wins-3 at 2-from 1000m to 2450m, R1,470,125, Turffontein South African Oaks, Gr.1, Yellowwood H., Gr.3, Clairwood King's Pact S., SNA Consulting Engineers Juvenile P., 2d Greyville Woolavington 2000 S., Gr.1, Turffontein Ipi Tombe Challenge, Gr.2, Clairwood Devon Air S., L, Turffontein Racing Association P., 3d Greyville Golden Slipper, Gr.1, 4th Kenilworth Paddock S., Gr.1, Turffontein South African Fillies Classic, Gr.1.